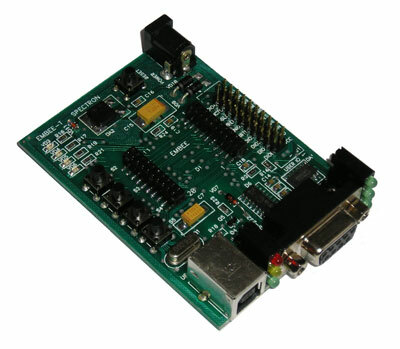 EMBee-T UART development board can be connected to a PC via RS-232 or USB. For RS-232 connection, power supply 5-25 V is required. All modem outputs are conducted to a test plug for technical solutions. Additional buttons and light-emitting diodes help monitor and reflect input/output ports. Modem configuration and data transmission can be performed via any terminal operating in Windows System.